Enclosure Volume Up to 265 Cu. Ft. Comments: Bought this WKL2200 unit to cool a 200 ft3 finished wine storage space in my basement here in PA. Unit is extremely easy to mount and install assuming the opening is supported by wall studs and an external shelf. Power cord is only 4ft long, so installing this product near the ceiling of an 8 ft wall as recommended implies that power outlets will need to be at least 4.5 ft above the floor in order to avoid extension cords. My basement is maintained at a relatively constant temperature of 65 F and covers about 2000 ft2, so the heat generated by the unit during operation is easily absorbed by that reservoir. Takes 3 days to cool the wine storage space to the desired set point temperature of 56 F. Now in week two of operation, the unit cycles off for 10 minutes and runs for 25 minutes to 30 minutes. It is absolutely critical to maintain as much thermal isolation between the hot air expelled at the top rear of the condenser side (hot side) of the refrigerator and the cool air intake immediately below the top vent as is practically possible. If you don't draw cool ambient air into the intake vents located below the exhaust vents, the unit will run continuously and refrigeration performance will deteriorate considerably. Consequently, the back cover must be installed in order to properly channel and separate the hot and cold air streams and if possible, the intake and exhaust air streams should be kept from mixing at the exhaust side as much as possible. Ideally, a hot air return to the main HVAC system should be located near the exhaust of this unit so as to keep the local ambient temperature constant and the thermal load on the wine cooler low. As we move into the cool season the cycle times should move towards longer power off periods. It is a pretty good unit for the money, but you have to know what you are doing during the installation in order to take full advantage of the cost effectiveness of the system. Comments: 2 temperature probes show perfect even temperatures in 2 separate locations within my 5'x5'x8' walk in cellar. I am very pleased. Comments: This is my second unit, and so far it has proven to be far superior to the former model. It maintains the same compact, easy to use design, but it is much quieter! 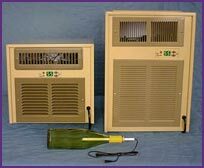 Comments: Bought this to replace a same-sized older model cooling an under-stairs wine closet. Easy to install, working well. Digital temp readout is a great improvement over older model. Only wish it were quieter, but all I have heard are noisy. Delivered promptly with free shipping as advertised.